Throughout Louisiana's colonial and postcolonial periods, there evolved a highly specialized vocabulary for describing the region's buildings, people, and cultural landscapes. 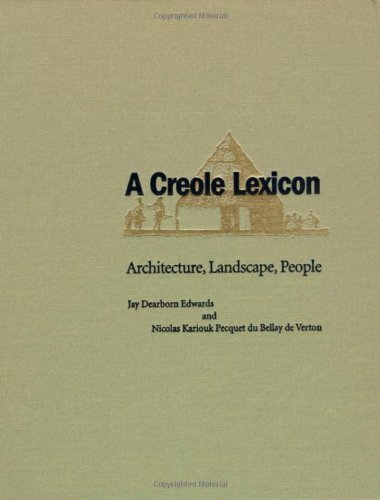 This creolized language -- a unique combination of localisms and words borrowed from French, Spanish, English, Indian, and Caribbean sources -- developed to suit the multiethnic needs of settlers, planters, explorers, builders, surveyors, and government officials. Today, this historic vernacular is often opaque to historians, architects, attorneys, geographers, scholars, and the general public who need to understand its meanings. With A Creole Lexicon, Jay Edwards and Nicolas Kariouk provide a highly organized resource for its recovery. Here are definitions for thousands of previously lost or misapplied terms, including watercraft and land vehicles, furniture, housetypes unique to Louisiana, people, and social categories. Drawn directly from travelers' accounts, historic maps, and legal documents, the volume's copious entries document what would actually have been heard and seen by the peoples of the Louisiana territory. Newly produced diagrams and drawings as well as reproductions of original eighteenth- and nineteenth-century documents and Historic American Buildings Surveys enhance understanding. Sixteen subject indexes list equivalent English words for easy access to appropriate Creole translations. A Creole Lexicon is an invaluable resource for exploring and preserving Louisiana's cultural heritage. If you have any questions about this product by LSU Press, contact us by completing and submitting the form below. If you are looking for a specif part number, please include it with your message.